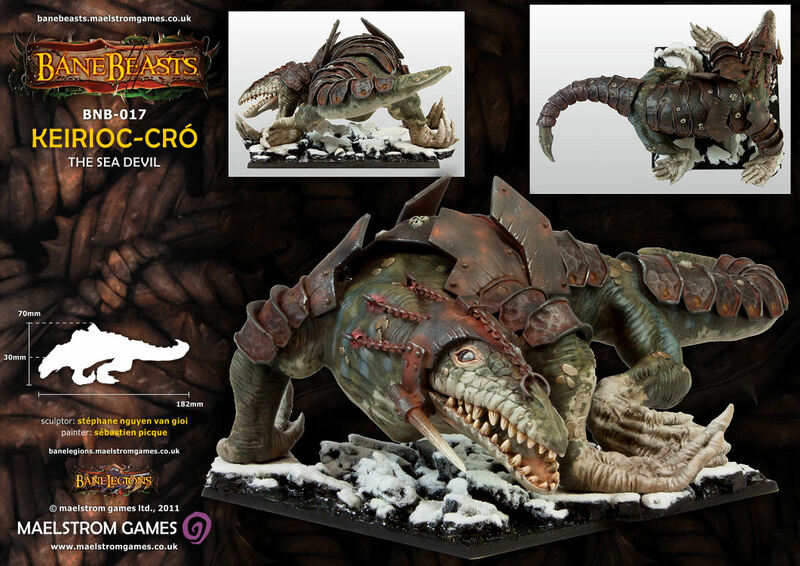 Die Banelegions werden um ein neues Banebeast erweitert, Keirioc-Cro, the Sea Devil. 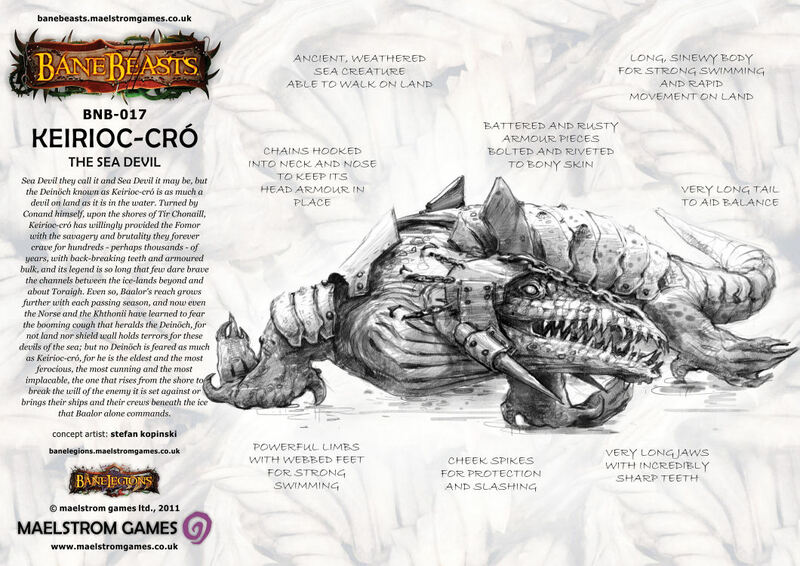 Sea Devil they call it and Sea Devil it may be, but the Deinöch known as Keirioc-cró is as much a devil on land as it is in the water. Turned by Conand himself, upon the shores of Tír Chonaill, Keirioc-cró has willingly provided the Fomor with the savagery and brutality they forever crave for hundreds – perhaps thousands – of years, with back-breaking teeth and armoured bulk, and its legend is so long that few dare brave the channels between the ice-lands beyond and about Toraigh. Even so, Baalor’s reach grows further with each passing season, and now even the Norse and the Khthonii have learned to fear the booming cough that heralds the Deinöch, for not land nor shield wall holds terrors for these devils of the sea; but no Deinöch is feared as much as Keirioc-cró, for he is the eldest and the most ferocious, the most cunning and the most implacable, the one that rises from the shore to break the will of the enemy it is set against or brings their ships and their crews beneath the ice that Baalor alone commands. Das Modell wurde von Stéphane NGuyen van Gio modelliert und ist für 49,99 Pfund ab dem 5. November erhältlich. Wow, mehr gibts dazu nicht zu sagen. hui, könnt ich mir sehr gut als Seeungeheuer für die Zombiepiraten vorstellen. Mit Krokodilen habens die Jungs von Bane Legions momentan anscheinend. Und der Preis scheint auch angemessen zu sein. Ein Wassertier mit schweren Panzerplatten? Hm. Sieht beeindruckend aus, aber mit optionaler Panzerung hätt ich es noch besser gefunden.